The order for the casting of the six driving wheels has been placed with The Boro' Foundry Ltd. at Lye, Stourbridge. This company has previous experience of this type of work. Quotes are being obtained for the supply and fitting of axles, tyres and crankpins. A regulator casting has been produced for a Standard class 4 locomotive and one of our members has very generously paid to have this component manufactured for 82045 at the same time. 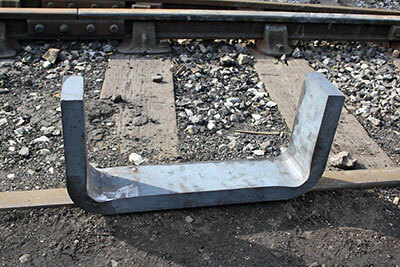 There has been a pause in the production of the rear pony truck casting whilst the Standard 2 project at the Bluebell Railway consult further with their foundry. 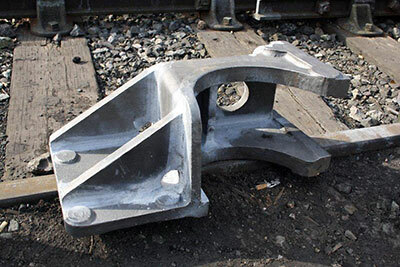 Two spring bracket castings have been manufactured and machining is underway. The remaining ten will be cast in due course. Some stiffening platework is being welded into the corners of the U shaped forgings for the pony truck axlebox guides. Reaming of horn guide and horn block holes for the driving wheels continues. Fitted bolts have been made for securing the front strecher to the smokebox saddle. Tony has received an acceptable quote for the work of final machining and assembly of the driving wheelsets, except for supply of tyres, which will be subject to a separate quotation from the same source. I am pleased to be able to confirm that we will have the necessary funding in place to cover the complete job, including purchase and fitting of the driving wheel tyres. We are also able to pay for the spring assemblies and axleboxes, the finance for the latter coming from general funds in order to leave the Wheel Appeal account untouched until absolutely necessary. I would like to thank all concerned for the fantastic success of the Wheel Appeal, which was launched only last March but which has exceeded our wildest hopes: we had thought that the wheeling of 82045 could be a sticking point for the project, but thanks to your generosity this is not proving to be the case. We can now start to concentrate on the front and rear pony assemblies, for which additional funding will be required, but the signs are very encouraging. All we've got to hope for now is that the firms contracted to do the various jobs don't drag their feet too much. Regular readers of the News updates will know that I have also started to plan for the engine's motion, fund-raising for which will run in tandem with that for the wheels. Without wishing to incur the wrath of my measured engineering colleagues, I will shortly be able to start drawing up plans for the boiler appeal, though it is not my intention to launch this until wheels and motion are on the home straight. Very provisionally - and please don't hold me to this - I am thinking in terms of mid-autumn next year. Watch this space! 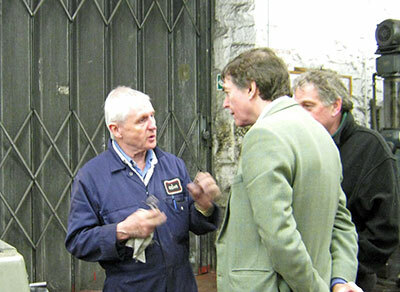 The sterling efforts of member Tony Cousins behind the scenes resulted in a visit to Bridgnorth by Ludlow MP Philip Dunne on Friday 15th March. Mr Dunne was given a tour of the 82045 site, then had lunch in the buffet before going over the tracks for a look around the SVR works. This included a "first" for him - a visit, courtesy of SVR fitter Will Marsh, to the footplate of WR pannier 1501 which was in steam in the engine yard. Thanks to all concerned for making this a successful visit, and especially to Gloria (an enthusiastic 82045 member!) and Keith for opening the buffet specially for us and for providing an excellent lunch. Don't forget that the Annual General Meeting is almost upon us: Saturday 6th April at 2.00 p.m. in the upstairs lecture theatre at Kidderminster Railway Museum. Please do your best to attend what should be a lively, interesting afternoon! The U shaped forging for the pony truck axlebox guides. One of the two spring bracket castings. The wheel pattern made by Boss Patterns of Coventry. 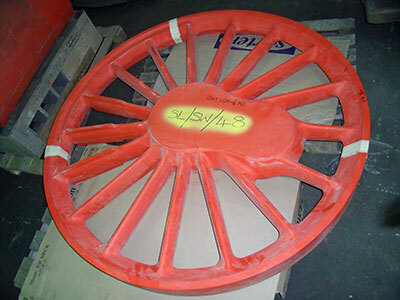 This photo is courtesy of The Boro` Foundry who will be casting the wheels. 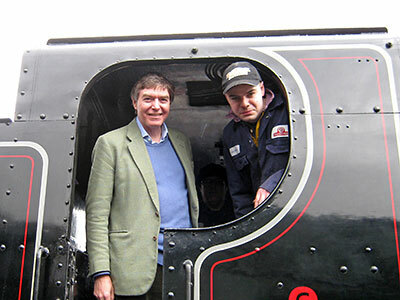 Ludlow MP Philip Dunne at Bridgnorth.